Looking to find a practice or game field? Below you’ll find a complete list of fields and locations. Click on the field name to view an interactive map and get directions. 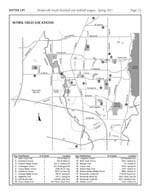 You can also find a map of the locations in spring newsletter – Batter Up!